This has really become the story that simply won’t go away. Just when it seemed investors had fully digested the implications of the Greek debt crisis, they once again turned their attention to it and attacked the Euro with renewed vigor. Summarized one analyst, “Fears regarding Greece have been reignited.” As a result, the Euro is already down nearly 10% on the year, and we are barely into the second quarter! Since I last posted on this issue, there have been a handful of key developments, the most important of which was the approval of an emergency loan packaged. Under the terms of the agreement, the EU will lend €30 Billion to Greece, and the IMF will lend an additional €15 Billion. Both loans will have 3-year terms and 5% coupons. While George Papaconstantinou, Finance Minister of Greece, “insisted that this was ‘not tantamount’ to asking for a bailout,” the markets were of the opposite mindset, which is why the Euro immediately advanced 1.5% when news of the loan package broke on April 12. Since then, the Euro has cooled, the Greek stock market has dropped, and borrowing costs have surged: “The spread between the government’s 10-year bonds and benchmark German debt [has risen] to 549 basis points, the highest in at least 12 years. 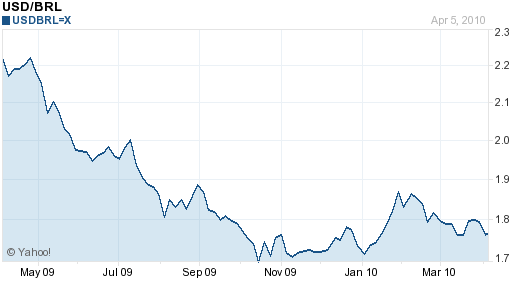 Credit- default swaps tied to Greece’s debt jumped 149 basis points to a record 635.” What happened?! It seems that despite the assurances of Eurozone countries that “parliamentary approval would take ‘one week or two weeks at the maximum’ ” and analysts’ assertions that “Greece is as close to activating the rescue package as one can imagine,” the markets were simply not convinced. Some EU member countries have warned that “new legislation” will be required to lend money to Greece and “a group of German professors are readying a challenge to the rescue plan in Germany’s constitutional court.” In short, until Greece has the money in hand, nothing can be taken for granted. In addition, Greece must refinance €8 Billion in short-term debt that expires on May 19, and investors are skeptical that it can do so at tolerable interest rates, if at all. For example, a US Dollar-denominated bond offering that was projected to bring in $5-10 Billion attracted only $1-4 Billion in institutional interest. Of course, there is also the concern that even if Greece can raise enough short-term cash to remain solvent, it will once again face trouble in the medium term: “An infusion of cash won’t fix Greece’s long-term problems, and the ‘only choice’ for Greece could be a ‘dramatic economic contraction,’ ” said one expert.Even if default wasn’t previously inevitable, it is quickly becoming self-fulfilling, since investors’ nervousness is leading to higher interest rates (aka borrowing costs), which is making it more difficult for Greece to reduce its budget deficit, which will cause investors to become more nervous, etc etc. Unsurprisingly, experts have begun to look at alternative scenarios, such as leaving the Euro. The consensus is that it would be mechanically and legally feasible, but economically catastrophic. It would result in massive currency devaluation and economic recession, and wouldn’t even eliminate the sizable chunk of Greek debt that is denominated in foreign currency. In short, it remains a last resort or last resorts, and isn’t even on the table at the moment. 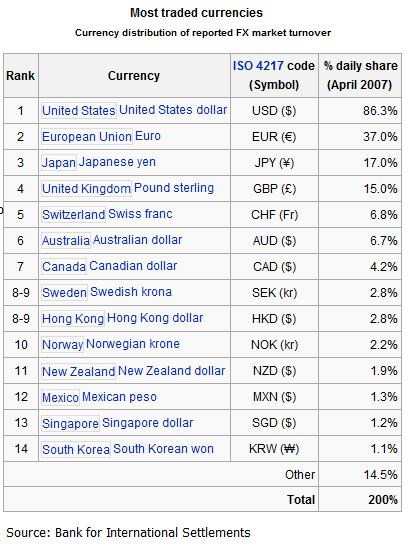 The Canadian Dollar’s performance of late has been eerily redolent of its sudden rise in 2007, when propelled by nothing more than sheer momentum, it rose 20% against the Dollar and breached the parity mark (1:1) en route to a 30-year high. [Of course, we all remember what happened next: the credit crisis struck, and the Loonie plummeted even faster than it had risen]. 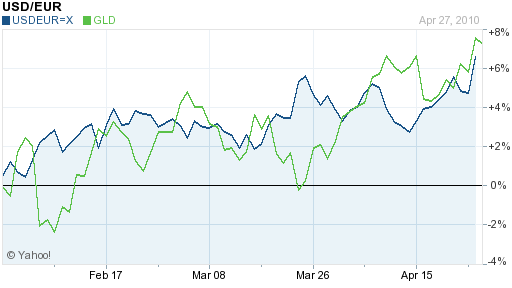 Last week, the Canadian Dollar breached parity again, and after a brief retreat, it touched parity again today. On the one hand, this latest rise was simply a matter of making up for the ground lost in 2008, when risk-averse investors shifted capital en masse to the US. On the other hand, Canadian fundamentals are fairly strong, and that the Loonie is once again at parity is deservedly so. 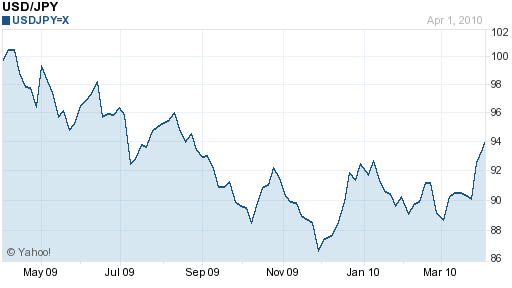 On the other hand, one has to wonder how long the momentum in the Canadian Dollar can continue. While Canada’s economic recovery has indeed been strong, it is no more impressive than the recovery in the US. (In fact, it should be noted that the two economies remain deeply intertwined). In addition, the (Canadian) economy is already expected to slow down slightly in 2011 (3.1%), and slow further in 2012 (1.7%), which makes me wonder whether the Bank of Canada will have to tighten slightly in order to achieve its inflation objectives. Moreover, while the BOC will probably hike rates slightly before the Fed, the arc of monetary policy followed by the two Central Banks will probably be pretty similar for the next few years, regardless of what happens. This means that interest rate differentials between the two economies should remain pretty close to the current level (near 0%), and won’t expand enough to make a CAD/USD carry trading strategy viable. It seems the futures markets concur, as the Canadian Dollar is projected to hover around parity with the USD for the bulk of the next 12 months. Granted, futures prices have pretty closely mirrored the Canadian Dollar’s performance in the spot market, but the point is that investors seem to expect the CAD/USD exchange rate to settle down for a while. 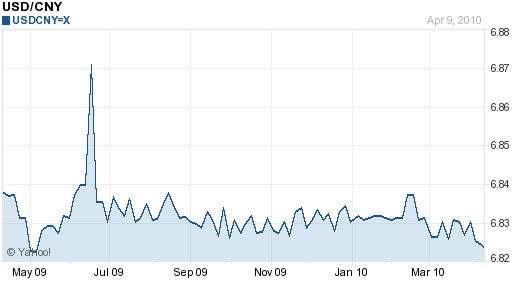 Remarked one analyst, “The Canadian dollar parity party is in full swing, however further Canadian gains will be at a much slower pace as the existing long Canadian positions get trimmed on profit taking in the absence of new bullish Canadian catalysts.” Incidentally, this is exactly what the Bank of Canada wants, and spent the better part of 2009 trying to convey to forex markets. If the Loonie were to rise further, it could threaten the economic recovery, and at the very least, the BOC would proba1bly hold off on hiking rates. In the end, 1:1 does seem like a reasonable exchange rate. I haven’t seen any economic models that argue one way or the other, but it certainly makes sense from the standpoint of convenience and market psychology. Barring any unforeseen developments, I don’t see it fluctuating very much in the short-term, one way or the other. 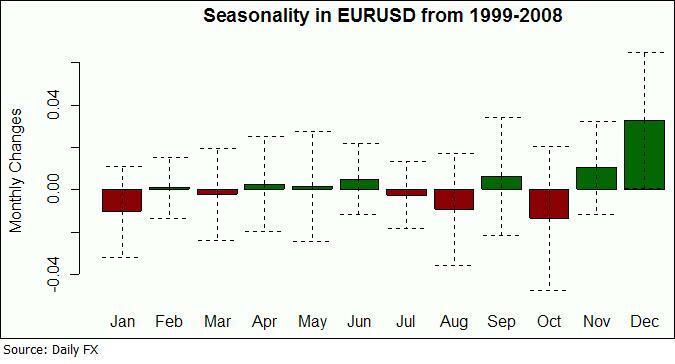 Forex Seasonality: Is it Real? I have always wanted to write a post about seasonality, but whenever push came to shove, I couldn’t see the point. Besides, I was never sure whether seasonality falls into the scope of technical analysis or whether it made sense to consider in fundamental terms, and for fear of overstretching, I stayed away. Recently, I read a column by Kathy Lien about forex seasonality. In fact, this article was merely an updated version of a nearly identical article that she contributed earlier to Investopedia, but nonetheless I found it informative, and I was finally inspired to address the topic on the Forex Blog. Basically, Lien’s analysis consisted of examining 10 years of data for a handful of major currency pairs, and picking out the month(s) for each pair in which performance tended to be most lopsided. (Since forex is zero-sum, it should be the case that over a long enough time horizon, the average fluctuation for every pair should sink to ~0%. For other types of securities/investments, this type of analysis might be less viable). She discovered that the USD has tended to rise against in the Yen in July, but to fall in August. 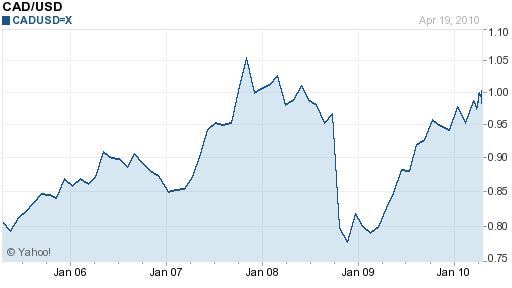 Meanwhile, the Dollar has tended to rise against the Euro in January, and fall against the Canadian Dollar in May. A similar study by DailyFX found that the US Dollar has also tended to rise against the Dollars of Australian, New Zealand, and Canada in the month of July. These numbers are certainly interesting. But, I want to offer a clarification that the authors, themselves, didn’t bother to make. Namely, when making statistical claims about trends, it’s important to perform statistical (and not just visual) analysis. For example, the fact that the authors based all of their conclusions on only 10 years of data means that the case for statistical significance (a mathematical concept which states that a certain result cannot be a product of pure chance) is not as strong as you would think. Given that major currencies have floated since 1973, there is at least 30 years of good data which can and should have been used in the analysis. For example, Lien observed that the US Dollar rose 80% of the time against the Yen against in the month of July. Given that the sample size (10 years) is only a fraction of the total data (let’s assume 30 years), we can say with 95% confidence (in accordance with statistical theory) that the actual fluctuation is somewhere between 60% and 100%. If you want to be 99% sure, then the interval expands to 53 to 100. To be fair, most traders would be perfectly happy with 95% confidence, and in this case, that means we can be 95% sure that the Dollar will rise against the Yen at least 60% of the time in the month of July. That’s not great, but still better than a coin-toss. If you bet on this trend every July over the next 10 years, then, you can be 95% sure that you will come out ahead. However, the average return over the last 10 years for this particular trend is only .39%, or 4.8% on an annualized basis. That’s not that impressive considering the margin of error and the amount of work that you had to do. As if this were not enough, Lien can’t even proffer an explanation why this is the case. (I’m certainly not blaming her; frankly I would be hard-pressed to come up with anything convincing). Being a fundamental analyst, personally, I like to have some idea (or delude myself into thinking I have some idea) as to why a certain trend exists, and I’m not content to simply take it as face value. Thus, even if statistical theory tells me that this particular trend probably isn’t a product of pure chance, from where I’m sitting, it might as well be. Actually, I was much more impressed with a similar piece of analysis that Lien published on FX 360, which looks at how volatility varies for USD/X currency pairs, from month-to-month. 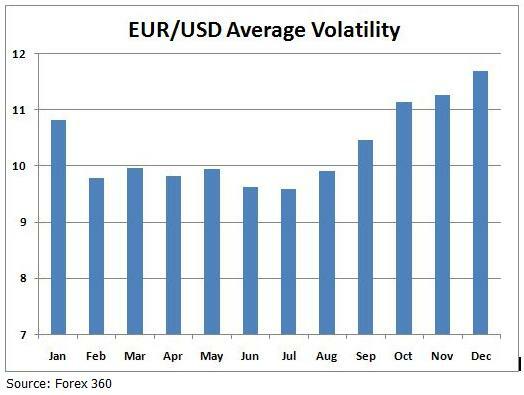 For all of the currency pairs that Lien examined, there is a clear pattern: volatility peaks in December/January and reaches a low in the summer. Not only is this trend clearly discernible, but also neatly explicable. In all of the financial markets, trading activity (and volatility, by extension) dries up in the summer as investors go on vacation. It slowly builds during the end of the year as portfolio managers churn their positions to try to meet their annual targets. From a practical standpoint, there are a few takeaways. First, if you’re a carry trader, know that the risk is generally higher in the winter than in the summer. While many traders may complain about the lack of fluctuation in July and consequent difficulty of profitably day trading, you can sit back and earn a low-risk return on the interest rate spread. With regard to the monthly trends for specific currency pairs that I referenced at the beginning of this post, I would say that they are certainly worth being aware of, especially if you’re a swing trader and tend to hold your positions for only a month. For shorter or longer-term trading, however, I don’t think most of these trends are actionable. Even in the handful of trends that seem to be bullet-proof, the fact that you must enter into the trade on the 1st of the month and exit on the last day of the month (since it’s on that basis that the trends were analyzed) would seem contrived and annoying. I have to admit- I’m intensely curious as to whether anyone has actually tried to trade on such a strategy. Please share your experiences below! Inflation: Much Ado about Nothing? You can see from the chart below that since the introduction of the Euro, inflation in the US has slightly outpaced Eurozone inflation (by about 5% on a cumulative basis). Over that same time period, the Euro first appreciated from slightly below parity with the US Dollar to $1.60, and then fell back to the current level of around $1.35. It’s clear (from the current sovereign debt crisis if nothing else) that the EUR/USD exchange rate, then, cannot be explained entirely by the theory of purchasing power parity. Still, insofar as inflation bears on interest rates and can be a consequence of economic overheating or excessive government spending, it is something that must be heeded. On that note, after a dis-inflationary 2009, prices in the US are once again rising in 2010, and inflation is projected to finish the year around 2%. Over the longer term, there is a tremendous amount of uncertainty regarding US inflation, for a couple reasons. The first is related to the Fed’s quantitative easing program, which pumped more than $1 Trillion into credit markets. While the Fed has basically stopped its asset purchases, all of this printed money is still technically in circulation, and some inflation hawks think it represents a ticking inflation time bomb. 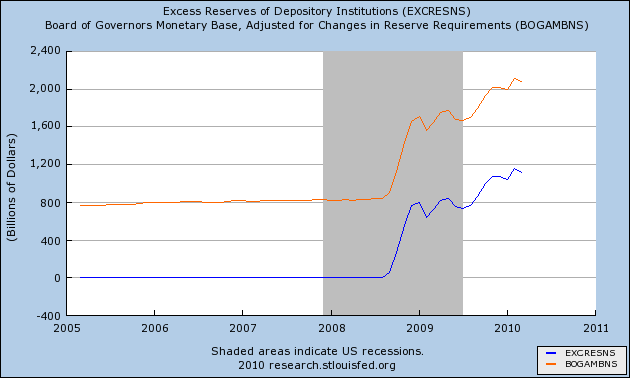 Doves respond that the Fed will withdraw these funds before they become inflationary, and that besides, most of the funds are actually being held by commercial banks in the form of excess reserves. (This notion is in fact born out by the chart below). The second potential driver of inflation is the skyrocketing national debt. While US budget deficits have long been the norm, they have grown alarmingly high in the past few years and are projected to remain high for at least the next decade. Beyond that, the US faces up to $70 Trillion in unfunded entitlement liabilities, which means that net debt will probably grow before it can fall. Hopefully, the US economy will outpace the national debt and/or foreign Central Banks continue to buy Treasury securities in bulk. The alternative would be wholesale money printing (to deflate the debt) and hyperinflation. Yields on both 10-year and 30-year Treasury securities remain enviably low, which means that buyers aren’t bracing for hyperinflation just yet. In addition, while gold continues to attract buyers despite record high prices, its rise has been closely tied to the performance of the stock market, which means that investors are currently using it to bet on economic recovery, rather than as a hedge against inflation. 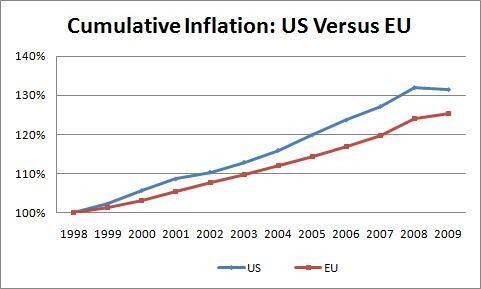 In short, inflation in the US certainly remains a real possibility. At this point, however, it remains too hazy to be actionable, and the forex markets will probably wait for more information before pricing it into the Dollar. The hoopla surrounding the semi-annual release of the Treasury’s currency report has been awkwardly resolved. As a result of Chinese Prime Minister Hu Jintao’s last minute decision to participate in a US conference on nuclear disarmament, the Treasury has agreed to delay the release of the report for an indeterminate period. While a handful of commentators saw this as a simple quid pro quo, the consensus among most of us is that a revaluation of the Chinese Yuan is now imminent. Technically, the RMB has been rising steadily for the last few months, and in fact, it recently touched a 9-month high against the USD. However, this appreciation has amounted to a mere .3%, certainly not enough to placate critics, many of whom insist that the RMB is undervalued by 25-40%. Probably within the next couple months (and as soon as tomorrow), the RMB peg will probably be lifted by at least 5% against the Dollar, and allowed to appreciate incrementally from there. Asian currencies should also benefit, since a more expensive Yuan will trigger a marginal shift of (speculative) capital to regional competitors, especially those with undervalued currencies. In fact, the Bank of Korea is already on high alert for any “unusual” (code for sudden appreciation of the Won) activity in the forex markets, and has suggested that intervention is always a possibility. As for me, well, I’m not taking any chances. I just transferred some of my savings from Dollars into Yuan (of course this wouldn’t really make sense if I didn’t live in China). I like to think of it as a rudimentary form of hedging. This doubt was sparked by an article that I read recently, entitled “Markets ‘Not Pricing’ Potential Risks,” which explored the idea that the renewed appetite for risk and consequent run-up in asset prices and re-allocation of capital is naively optimistic: ” ‘The unique environment we’re in now revolves around unprecedented level of government involvement in markets, which creates this complacency over risk because of this belief that governments will fix everything.’ Markets are under-pricing the risk that nations such as Dubai and Greece may default, and excess borrowing by others could lead to inflation.” From a financial standpoint, the practical implications of this idea is that the markets are underpricing risk. In forex markets, complacency towards risk has manifested itself in the form of decreasing volatility. When you look at the 435 most commonly-traded currency pairs (actually most currency pairs involving the 35 most popular currencies), volatility is increasing for only nine of them. In addition, one month-volatility is now below 15% for all (widely-traded) currency pairs, which means that based on the most recent data, the highest, annualized standard deviation percentage change for every currency pair is only 15%. [It’s difficult to translate that concept into plain-English, but the basic idea is that all currencies are (actually, only 68% of the time) currently fluctuating by less than 15% from the mean on an annualized basis. The idea of standard deviation is murky for non-mathematicians, so it’s probably more useful to look at it on a relative and historical basis, rather than in absolute terms. In other words, the 15% figure can not be explained very well in an of itself; one must see how it compares to other currency pairs and to other time periods]. The fact that volatility is currently low suggests that the carry trade, for example, is set to become increasingly viable, especially when you factor in upcoming interest rate hikes. On the other hand, real interest rate differentials are currently modest (from a historical standpoint), and the concern is that rate hikes could be accompanied by rising volatility. The Brazilian Real, for example, “has a risk-adjusted carry of 45 percent, based on Morgan Stanley estimates, which means its carry rates had been better than current levels 55 percent of the time the last five years.” When you look at conditions from a few years ago, when volatility was at record low levels and interest rate differentials were larger than historically average, it’s obvious that the hey-day for the carry trade was in the past. It may come again in the future, but it certainly isn’t now. From a practical standpoint, if you’re thinking about getting involved in the carry trade, you’ll want to choose a currency pair where the real (after adjusting for inflation) interest rate differential is high and volatility is low. You can cross-reference interest differentials with these charts – which uses recent mean return and volatility as the basis for forecasting confidence intervals – to get an idea about which pairs offer the best value (i.e. higher rate differentials at lower volatility). Just be aware that a sudden upswing in volatility could put a big dent in your risk-adjusted returns. Japanese Yen: Will We See Intervention? The Japanese yen has fallen 5% against the Dollar over the last month, and 10% since touching a record high in November. 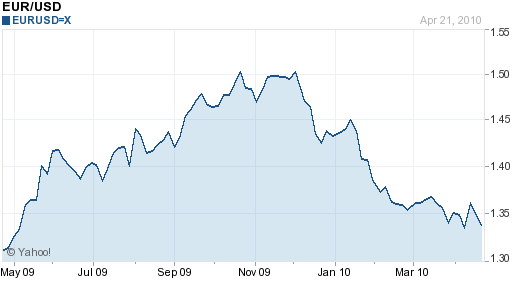 Since this certainly isn’t explainable in the context of the EU debt crisis, what’s going on?! The primary factor behind the Yen’s decline appears to be seasonal, given the “end of the Japanese fiscal year on March 31, a time when Japanese corporations stop their annual repatriation of foreign profits by converting them into yen, which had kept demand for the currency high.” Analysts add that “A new fiscal year also is a chance for Japanese investors to reset strategies for sending capital abroad and for Japanese companies to set hedging bets for the coming year.” In short, this trend is short-term, and will likely abate in the coming weeks. Beyond this, it’s difficult to explain the Yen’s decline in terms of financial and economic factors. Japans economy is still lackluster, though its stock market is performing well. I have blogged recently about Japan’s budget deficits and soaring national debt, but given that this debt is financed domestically, fluctuations in the risk of Japanese sovereign default have very little impact on the exchange rate. It’s possible that an increase in risk appetite and consequent revival in the carry trade is behind the Yen’s weakness, but given that US interest rates remain just as low, it makes little sense that the Yen should be falling so precipitously against the Dollar. Even though the Japanese economy grew by a healthy 3.8% in the fourth quarter of 2009, there remain concerns of contraction and deflation. Many experts agree that the Yen is overvalued, which means that exports are less than what they could be. Analysts love to point out that Japan’s economy is so sensitive to changes in exchange rates, that a fall of one “unit” (100 pips) in the Japanese Yen would be enough to cause some companies to swing from profit to loss. Simply, there is too much at stake for the Japanese economy (and the incumbent Japanese government) to simply let the Yen be. For now, the Central Bank of Japan will attempt to use monetary policy to coax down the Yen, perhaps through a combination of liquidity programs and money-printing, but there are a handful of important meeting coming up, during which time it could conceivably decide to join the ranks of a handful of other Central Banks which have already moved to depress their currencies. 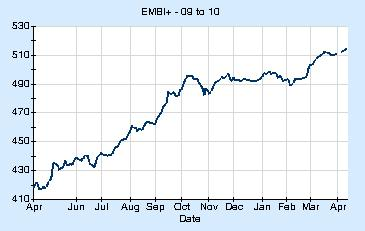 Let the Beggar Thy Neighbor Currency Devaluation begin.